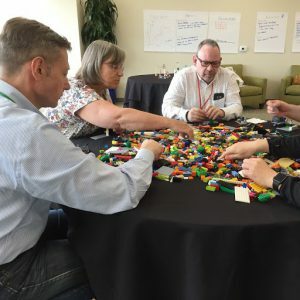 We’ve found that Lego® Serious Play® can be an amazingly useful tool tackling tough organization problems like Leadership Development, Organizational Design, Change Management, Strategy Design, and Strategic Planning. 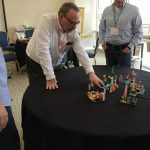 We’ve decided to embed some serious large-scale Lego® Serious Play® action into the very tapestry of the SDI Miami conference experience. This will not be a separate workshop that only a few can attend. Instead, we’re hoping to provoke change and learning by making it a central part of the conference experience including attendees, speakers, facilitators, and staff in an epic exploration of systems and complexity thinking. LEGO® SERIOUS PLAY® was developed at Swiss-based Imagination Lab and relied on numerous theoretical works on Strategy Process (Mintzberg), Theory of Flow (Csikszentmihalyi), Change Management (Lewin, Schon, Argyris), complex adaptive systems (Holland), approaches on imagination and creativity (Kearney), as well as Strategy-as-Practice (Schön, Mintzberg). Dean Meyers is the Chief Innovation Officer of the Design Thinking & Strategy consultancy Dean Meyers Inc. He is also Publisher and Managing Editor of VizWorld.com. Dean facilitates, coaches, and trains executives with visual-thinking methods in strategic planning, process innovation, customer experience focused marketing, and the application of VR/AR/MR for organizational learning. His clients include technology firms, enterprise manufacturers of food and pharmaceuticals, military and government agencies, educational institutions, as well as advertising and media companies. Dean is a certified Lego® Serious Play® facilitator and former CTO and board member of the International Forum of Visual Practitioners. To share his enthusiasm and belief in the power of applying visual thinking to improve the quality of individual and business intelligence, communication and decision-making abilities, he publishes the online news media, www.VizWorld.com.